Former FBI agents don’t believe there will be any definitive action on the case involving alleged public corruption in Tallahassee before Election Day. When Andrew Gillum won the Democratic gubernatorial primary in a stunning upset last week, it catapulted the small capital city's mayor — and his unabashedly progressive, Bernie-Sanders-backed platform — into the national political spotlight overnight. But his victory has also brought that bright glare to a years-long, ongoing federal probe of alleged public corruption in Tallahassee involving development deals and City Hall, which is expected to remain a major battering ram for the GOP against the unexpected Democratic nominee. Though speculation has outpaced publicly released evidence around the probe — which appears to have narrowed in on several prominent locals including a former Gillum ally and a city commissioner — Republican strategists began leveraging it against Gillum just moments after he was anointed to lead the Democrats' state ticket. Gillum has repeatedly said he was told by the FBI he is not the target of its investigation and, after meeting with the Florida Commission on Ethics Tuesday morning, he released receipts from two trips he took that have drawn attention because of the probe. Former FBI agents don't believe there will be any definitive action on the case before Election Day. "They don't want to get accused with influencing the outcome of the election," said Chris Quick, a former special agent who specialized in white-collar crimes and now runs a private investigations firm. "The last thing they want is more criticism." Absent an exoneration or indictment, the miasma of impropriety is certain to continue to feed criticism of Gillum throughout the general election. The story of the FBI investigation long preceded Gillum's decision in early 2017 to run for governor. According to the Tallahassee Democrat, agents came to town as early as 2015, acting as businessmen looking at investments in the city. Under the pseudonyms Mike Sweets, Mike Miller and Brian Butler, they interacted for months with local officials and their partners, including longtime Gillum friend and lobbyist Adam Corey. According to documents requested by the investigation and made public by the city, the part of the sprawling probe that's likely most relevant to Gillum has focused on Corey, a college friend who also briefly served as volunteer treasurer of Gillum's mayoral run in 2014, and development deals involving the city's community redevelopment agency. In 2013, the Community Redevelopment Agency voted to give more than $2.1 million in taxpayer funds to renovate the Edison, a downtown restaurant project Corey co-owns. Gillum voted with the rest of his fellow city commissioners — who sit on the CRA — to fund it, which raised eyebrows at the time. Under the city's form of government, Gillum is not a "strong mayor" and is one of five votes on the city commission. Corey, who Gillum cut ties with last year, became close with the agent known as Miller after the agents arrived in town and introduced Gillum to the undercover agent in 2016, according to the Democrat. Miller, the Democrat reported, wanted the city to expand the jurisdiction of the community redevelopment agency to include a parcel of land Miller said he would develop and solicited Corey to achieve that goal. Later that year, the CRA — which Gillum chairs — voted unanimously to expand the jurisdiction, though he wasn't present for that vote. Gillum, Corey and Miller also met in New York that year, during a business trip Gillum took in his capacity with the liberal People for the American Way Foundation. In an email inviting Gillum to meet, Corey noted that Miller had arranged hotel rooms, an outing to a Mets game and a boat trip to the Statue of Liberty, according to the Democrat. The Democrat reported that two of the undercover agents joined Gillum, Corey and Gillum's brother Marcus on the boat in New York Harbor. Gillum's campaign told the New York Times that his Manhattan hotel stay — as well as tickets to see the musical Hamilton — were paid for by his brother, and that the musical ticket was exchanged for a Jay-Z concert ticket Corey received from Marcus Gillum. The mayor, his brother, and Corey saw the musical with one of the agents, according to the Times. Despite photos of Gillum, Corey and an agent on the boat trip published by Tallahassee station WCTV, the mayor said the undercover agent paid for no part of Gillum's travels and that he stayed elsewhere. Gillum's receipts released Tuesday covered some charges from the New York and Costa Rica trips, including a bill for a two-night stay at the Ameritania Hotel in New York (to the Open Society Foundation, a George Soros organization) and a $400 cash withdrawal the campaign said covered lodging for the Costa Rica vacation. Just months after Gillum announced he was seeking the Governor's Mansion in March 2017, agents delivered a subpoena to City Hall requesting thousands of pages of records on city officials. A Florida Bar article also revealed details of the investigation around that time when Joshua Doyle, a former Tallahassee FBI field supervisor, applied to work as the organization's executive director. He described building a 20-person team — including intelligence analysts and forensic accountants — for a "sensitive two-year undercover investigation" to the tune of half a million dollars. Since then, federal officials have issued at least two more rounds of subpoenas, though none have specifically named Gillum or records specific to him. Those subpoenas and a search warrant that was accidentally released online by federal officials in February have indicated the probe has narrowed in on a city commissioner, Scott Maddox, some of his former business associates and developers. The Democrat reported that Maddox was photographed on a trip to Las Vegas with three of the agents sometime in 2016. Maddox has said he is innocent. Charges with regard to any arm of the investigation have yet to be filed. A federal grand jury in Tallahassee has been impaneled, and the Democrat reported in July that several players in the probe or their attorneys had been seen at the federal courthouse, suggesting some progress in the case. After news of the investigation broke, Gillum struggled to court financial donors. But until last week, few expected that blisteringly close attention to the probe would stretch far past Tallahassee's city limits. Gillum's win has now dramatically changed the context of the probe and how widely it will be noted. Ron DeSantis, the GOP nominee, wasted little time in mentioning the FBI investigation to Fox News' Laura Ingraham on election night: "He's embroiled in corruption scandals… This guy can't even run the city of Tallahassee — there's no way Florida voters can entrust him with our entire state." The Republican Governors Association released a digital advertisement the next day that showed a series of news reporters talking about Gillum as headlines about the probe floated over the screen. "Andrew Gillum Can't Be Trusted," the final frame of the ad read. 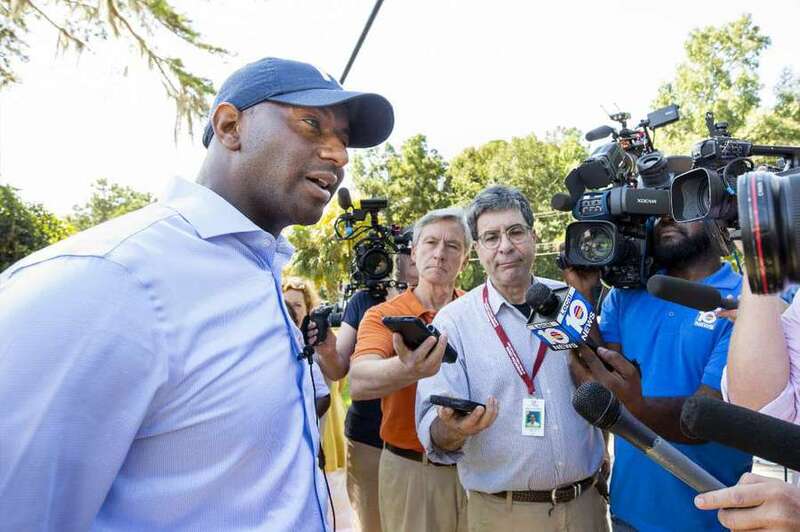 “The rumor that Marcus Gillum has been paid is false,” campaign communications director Geoff Burgan said. In a race now already rife with comparisons to the presidential campaign of 2016, the long-simmering Tallahassee drama echoes another FBI investigation: the one into Hillary Clinton's use of a private email server. "Again, a botched FBI investigation is affecting a major election," said former FBI agent Jeff Danik, who once headed the bureau's West Palm Beach office and had no immediate knowledge of this case. "The FBI and Department of Justice don't have any good options at this point." It's unlikely that Gillum — who has not been directly implicated — will be able to completely shake its cloud. But political experts say whether or not it is resolved before election day, the FBI investigation could affect the perception of Florida voters. "If Republicans or outside groups attack that over and over again, it certainly has the potential to sway some voters," said Aubrey Jewett, a political science professor at the University of Central Florida. "We know from political science and political communication research, that the reason that attack ads are so often used is that they have some effect on some people." Florida State University political science professor Carol Weissert wrote in an email to the Times/Herald that if Republicans want to sway those voters, they'll have to define Gillum as corrupt early in the campaign. But it's also possible an attempt to paint a rising African-American political star as corrupt could backfire for Republicans, galvanizing Gillum's diverse, progressive base. "Many black voters believe — and sometimes with some evidence — that black politicians are singled out and unfairly treated in investigations," Jewett said. Warren Davis, a recording artist from Tampa who knew about the investigation when he cast his ballot for Gillum in the primary, said he is much more concerned about the documented corruption in Washington than any possible wrongdoing in Tallahassee. "I think that the fact that he's being open and honest about it, to me that's vastly different from what we've seen on the national level because Trump is not being open or honest about anything," Davis said. Still, campaign spokesman Geoff Burgan said they do not intend to pressure federal officials to publicly corroborate Gillum's assertion he is not part of the probe before election day. "The investigation is going to run its course, and we want it to be thorough. We're not going to pressure them in any kind of significant or consistent way," Burgan said in a text message. "Obviously we'd like the public to have the facts, but understandably public integrity cases can and do take time to get right." Times/Herald Tallahassee Bureau staff writer Lawrence Mower contributed to this story.